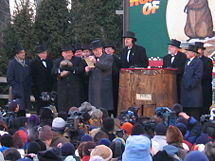 Groundhog Day 2005 in Punxsutawney, Pennsylvania, USA. Groundhog Day is a holiday celebrated in the United States and Canada on February 2, each year. In weather lore, if a groundhog emerges from its burrow on this day and fails to see its shadow because the weather is cloudy, winter will soon end. If, on the other hand, it is sunny and the groundhog sees its shadow, the groundhog will supposedly retreat into its burrow, and winter will continue for six more weeks. Candlemas is usually celebrated on the same day in Europe, and has similar weather lore about the coming weather, making it a possible origin of the holiday in North America. It has long been a human desire to make accurate weather predictions. For the farmer wanting to plant crops, for the merchant about to send ships on trade or anyone planning a journey, foreknowledge of future weather circumstances is significant. Prior to advances in science and technology allowing the development of weather forecasting as a predictive science, people used past experience to make predictions. Superstition and mythology played a significant role in efforts to predict weather. Animal behavior, such as the badger and later the groundhog, has also been used in this way, reflecting human recognition of the validity of animal instincts in guiding their behavior. The development of holidays such as Groundhog Day also shows the desire human beings have to mark significant times with celebration, bringing happiness and a chance to spend time together in an enjoyable fashion. Thus, Groundhog Day continues to be celebrated to this day, despite the fact that the predictions of groundhogs in this way have no significant value with regard to the length of winter. The groundhog (Marmota monax) is a rodent of the family Sciuridae, belonging to the group of large ground squirrels. Last Tuesday, the 2nd, was Candlemas day, the day on which, according to the Germans, the Groundhog peeps out of his winter quarters and if he sees his shadow he pops back for another six weeks nap, but if the day be cloudy he remains out, as the weather is to be moderate. Candlemas, also known as the Purification of the Virgin or the Presentation, coincides with the earlier pagan observance Imbolc. In Western countries in the Northern Hemisphere, the official first day of spring is about six weeks after Groundhog Day, on March 20 or March 21. If the sun made an appearance on Candlemas Day, an animal would cast a shadow, thus predicting six more weeks of winter. According to folklore, Germans watched a badger for his shadow on that day. When they settled in Pennsylvania, the groundhog (also known as the woodchuck), which resembles the European hedgehog and emerges from hibernation at that time of year, was chosen to replace the badger. The first official Groundhog Day was celebrated on February 2, 1886, in Punxsutawney, Pennsylvania. The local newspaper, The Punxsutawney Spirit, printed the proclamation "Today is groundhog day and up to the time of going to press the beast has not seen its shadow." Alternatively, the custom could have been a folk embodiment of the confusion created by the collision of two calendrical systems. Some ancient traditions marked the change of season at cross-quarter days such as Imbolc, when daylight first makes significant progress against the night. Other traditions held that spring did not begin until the length of daylight overtook night at the Vernal Equinox. 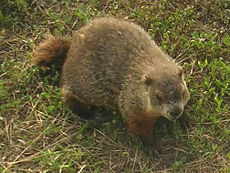 So an arbiter, such as the groundhog or hedgehog, was incorporated as a yearly custom to settle the two traditions. Sometimes spring begins at Imbolc, and sometimes Winter lasts six more weeks until the equinox. Another explanation of the origin of the day is that about 1,000 years ago, before the adoption of the Gregorian calendar, the spring equinox fell on March 16. This was exactly six weeks after February 2. Assuming that the equinox marked the first day of spring in certain medieval cultures, as it does now in Western countries, Groundhog Day occurred exactly six weeks before spring. Therefore, if the groundhog saw his shadow on Groundhog Day there would be six more weeks of winter. If he did not, there would be 42 more days of winter. In other words, the Groundhog Day tradition may have begun as a bit of folk humor. Towns throughout North America are known to have winter-predicting groundhogs. The most famous is Punxsutawney Phil of Punxsutawney, Pennsylvania (immortalized in the movie Groundhog Day). There is also "Brandon Bob" of Brandon, Manitoba; "Balzac Billy" in Alberta; "General Beauregard Lee" in Lilburn, Georgia; "Shubenacadie Sam" in Nova Scotia; "Staten Island Chuck" in New York; "Gary the Groundhog" in Kleinburg, Ontario, and "Wiarton Willie" in Ontario, among many others. As stated, the appearance of the groundhog's shadow means six more weeks of winter, and no shadow means spring is around the corner. Groundhog Day proponents state that the rodents' forecasts are 75- to 90-percent accurate. A Canadian study for 13 cities in the past 30 to 40 years puts the success rate level at only 37 percent. The National Climatic Data Center reportedly has stated that the overall predictions accuracy rate is around 39 percent. Punxsutawney Phil, fully titled "Punxsutawney Phil, Seer of Seers, Sage of Sages, Prognosticator of Prognosticators and Weather Prophet Extraordinary," is a groundhog resident of Punxsutawney, Pennsylvania. On February 2, Groundhog Day of each year, the town of Punxsutawney celebrates their beloved groundhog with a festive atmosphere of music and food. During the ceremony, which begins well before the winter sunrise, Phil emerges from his temporary home on Gobbler's Knob, located in a rural area about two miles east of town. According to tradition, if Phil sees his shadow and returns to his hole, the United States will have six more weeks of winter. If Phil does not see his shadow, spring will arrive early. During the rest of the year, Phil lives in the town library with his "wife" Phyllis. A club of Phil enthusiasts, known as the Punxsutawney "Save the Bearded Owls" Club, take care of the famed rodent year-round. A select group, called the "Inner Circle," plan the annual ceremony. Members of the Inner Circle are recognizable by their top hats and tuxedos. Of the 112 predictions made on record so far, Punxsutawney Phil has predicted an early spring 14 times (13 percent). As to his accuracy, according to the Punxsutawney Groundhog Club Inner Circle, he is 100-percent accurate. Wiarton Willie is a famous Canadian groundhog who lives in the community of Wiarton in Bruce County, Ontario. Every February 2, on Groundhog Day, Willie takes part in the local Wiarton Willie Festival. His role is to predict whether there will be an early spring. Although the original Wiarton Willie died in 1999, the Wiarton groundhog day celebrations continue each year with the original Willie's successors, referred to as "Wee Willie." The story of Wiarton Willie dates back to 1956. A Wiarton resident named Mac McKenzie wanted to showcase his childhood home to his many friends, so he sent out invitations for a "Groundhog Day" gathering. One of these invitations fell into the hands of a Toronto Star reporter. The reporter traveled to Wiarton looking for the Groundhog Day event. None of the townspeople knew about a festival, but one suggested he check at the Arlington Hotel where the reporter found McKenzie and his friends and was invited to join their party. The next day, the reporter lamented to McKenzie that he needed some kind of story to take back to justify his expenses. So McKenzie took his wife's fur hat, went out to the parking lot, dug a burrow in the snow and pronounced a prognostication (which no one remembers). The picture of Mac and the hat ran in the February 3, 1956 edition of the Toronto Star. A year later, about 50 people arrived for the festival. Half were reporters from various media, including the CBC and Canadian Press. Seizing on the opportunity, McKenzie invented a festival that has been added to over the years. Groundhog Day in Wiarton has become a major celebration, with dances, parades, ice hockey tournaments, curling bonspiels, pancake breakfasts, darts, and snooker tournaments, sleigh rides, a Monte Carlo Night, and a fish fry. Around 10,000 people are said to attend. Wiarton Willie himself is a more recent addition to the festivities. In the early years, prognostication was provided by the "mythical" trio of groundhogs: Grundoon, Muldoon, and Sand Dune. Willie appeared on the scene in the 1980s. He is claimed locally to be accurate in his prognostications around 90 percent of the time, although scientific studies show groundhog predictions to have a success rate of more like 37 percent. The original Wiarton Willie lived to the advanced age of 22, and was found dead only two days before Groundhog Day in 1999. The organizers were unable to find a replacement, and instead marked Groundhog Day by revealing "Willie" in a coffin. He had been dressed in a tuxedo, with coins over his eyes, and a carrot between his paws. A scandal ensued when it transpired that the real Willie had in fact decomposed, and the body in the coffin was that of an older, stuffed groundhog. The Associated Press was obliged to issue a retraction on its wires. Staten Island Chuck is a groundhog who resides in the Staten Island Zoo in Staten Island, New York in the United States. He is noted as the official groundhog meteorologist of New York City who predicts the duration of winter each February 2 on Groundhog Day. He makes the prediction based on whether or not he sees his shadow at 7:30 a.m. on Groundhog Day. The ceremony at the zoo is often attended and officiated by the Mayor of New York City. The Staten Island Zoo claims that Chuck has correctly predicted the duration of winter over 80 percent of the time since the 1980s. General Beauregard Lee is a groundhog that resides at the Yellow River Game Ranch in Lilburn, Georgia just outside of Atlanta. He has received honorary doctorates from the University of Georgia—"DWP, Doctor of Weather Prognostication"—and Georgia State University—"Doctor of Southern Groundology." He has been predicting early springs or late winters for 14 years and the Game Ranch claims a 94 percent accuracy rate. Jimmy the Groundhog of Sun Prairie, Wisconsin, U.S.
Dunkirk Dave in Dunkirk, New York, U.S.
Malverne Mel and Malverne Melissa found in Malverne, New York, U.S.
Brandon Bob of Brandon, Manitoba, Canada. Balzac Billy of Balzac, Alberta, Canada. Shubenacadie Sam of Shubenacadie, Nova Scotia, Canada. Gary the Groundhog of Kleinburg, Ontario, Canada. Spanish Joe of Spanish, Ontario, Canada. Sir Walter Wally of Raleigh, North Carolina, U.S. Pardon Me Pete of Tampa, Florida, U.S.
Octoraro Orphie of Quarryville, Pennsylvania, U.S.
Holtsville Hal of Holtsville, New York, U.S.
Buckeye Chuck of Marion, Ohio, U.S. The 1993 comedy movie, Groundhog Day, takes place in Punxsutawney, Pennsylvania, on Groundhog Day. The main character (played by Bill Murray) is forced to relive the day over and over again until he can learn to give up his selfishness and become a better person. As a result of this movie, in popular culture the phrase "Groundhog Day" has come to represent going through a phenomenon over and over until one spiritually transcends it. Aside from the Candlemas origins of Groundhog Day, some other days are considered predictors of the weather to come. In the United Kingdom, July 15 is known as Saint Swithun's day. At one time it was believed if it rained on that day, it would rain for the next 40 days and nights. However, since there is very little likelihood of such a protracted period of continual rain, it is more likely that the belief was simply that the ensuing summer would be wetter than average. In France as well as in Hungary, June 8, the feast day of Saint Médard fulfills the same function. Besides Saint Médard, other saints associated with weather prediction included Urban of Langres, and Saint Gervase and Saint Protais (June 19). Saint Quirinus of Neuss in Germany is a Roman martyr and saint of the Catholic and Eastern Orthodox churches. A farmers' saying associated with Quirinus' feast day of March 30 is Wie der Quirin, so der Sommer (“As St. Quirinus’ Day goes, so will the summer”). Also in Germany, June 27 is Siebenschläfertag (Seven Sleepers Day). If it rains that day, the next seven weeks or the rest of summer is supposedly going to be rainy. While it might seem to refer to the Siebenschläfer squirrel (Glis Glis), also known as the "edible dormouse," they day actually commemorates the Seven Sleepers of Ephesus, a Christian legend dating from around the sixth century. The exact date of this day has been disputed, being affected by the change from the Julian calendar to the Gregorian calendar, making July 7 the actual Seven Sleepers Day. Based on this date the prediction has a slightly increased probability in the southern parts of Germany not affected by the jet stream. ↑ StormFax, Groundhog Day. Retrieved January 21, 2009. ↑ 2.0 2.1 William Shepard Walsh, Curiosities of Popular Customs and of Rites, Ceremonies, Observances, and Miscellaneous Antiquities (Philadelphia, PA: J.B. Lippincott Co., 1898). Retrieved January 21, 2009. ↑ 3.0 3.1 Albrecht Powell, What in the Heck is Groundhog Day Anyway? About.com, 2009. Retrieved January 22, 2009. ↑ Margaret Kruesi, Groundhog Day, Journal of American Folklore 120 (477): 367+. ↑ Don Yoder, Groundhog Day (Stackpole Books, 2003, ISBN 0811700291). ↑ Jason Patton, The Shadow Report: Whether Punxsutawney Phil Sees or Doesn't See His Shadow. Retrieved January 22, 2009. ↑ David Phillips, "Groundhog Day," The Canadian Encyclopedia, Historica Foundation of Canada. Retrieved January 22, 2009. ↑ Pet Love Shack, Groundhog Day. Retrieved January 22, 2009. ↑ South Bruce Peninsula, "He Cast No Shadow." Retrieved January 22, 2009. ↑ South Bruce Peninsula, "How the Festival Started." Retrieved January 22, 2009. ↑ Jim Fox, "Waking Wiarton Willie," February 2, 2007. Retrieved January 22, 2009. ↑ South Bruce Peninsula, Wiarton Willie Festival Events. Retrieved November 3, 2007. ↑ 13.0 13.1 CBC News, "What Wiarton Willie sees," February 2, 2007. Retrieved January 22, 2009. ↑ Pollenatrix, "Groundhog Tales," May 27, 2004. Retrieved January 22, 2009. ↑ Staten Island Advance, "Staten Island Chuck makes a warm prediction," February 02, 2008. Retrieved January 22, 2009. ↑ Yellow River Game Ranch, "Beau's Bio… and more than you ever wanted to know about Groundhog Day!" Retrieved January 22, 2009. ↑ Anthony Aveni, The Book of the Year: A Brief History of Our Seasonal Holidays (Oxford: Oxford University Press, 2004, ISBN 0195171543), 30-31. ↑ IMDB, Groundhog Day (1993). Retrieved January 22, 2009. ↑ Suzanne Daughton, "The spiritual power of repetitive form: Steps toward transcendence in Groundhog Day," Critical Studies in Mass Communication 13(2) (Jun 1996): 138. ↑ Aquinas and More, St. Medard, 2009. Retrieved January 23, 2009. ↑ Ökumenisches Heiligenlexikon, Quirinus von Rom (von Neuss), 2000. Retrieved January 23, 2009. ↑ Penguin's Berlin Guide, Siebenschläfertag—June 27th. Retrieved January 23, 2009. Aaron, Michael A., Brewster B. Boyd, Jr., Melanie J. Curtis, and Paul M. Sommers. "Punxsutawney's Phenomenal Phorecaster." The College Mathematics Journal 32(1) (Jan., 2001): 26-29. Retrieved January 21, 2009. Aveni, Anthony. The Book of the Year: A Brief History of Our Seasonal Holidays. Oxford: Oxford University Press, 2004. ISBN 0195171543. Cohen, H., and T. P. Coffin. The Folklore of American Holidays. Detroit, MI: Gale Research, 1987. ISBN 978-0810321267. Old, W. C., and P. Billin-Frye. The Groundhog Day Book of Facts and Fun. Morton Grove, IL: Albert Whitman, 2004. ISBN 978-0807530665. Pulling, A. F. Around Punxsutawney. Charleston, SC: Arcadia, 2001. ISBN 978-0738505305. Walsh, William Shepard. Curiosities of Popular Customs and of Rites, Ceremonies, Observances, and Miscellaneous Antiquities. Philadelphia, PA: J.B. Lippincott Co., 1898. OCLC 297296. Yoder, Don. Groundhog Day. Mechanicsburg, PA: Stackpole Books, 2003. ISBN 978-0811700290. All links retrieved July 17, 2017. Groundhog.org, the official site of the Punxsutawney Groundhog Club. This page was last modified on 17 July 2017, at 21:39.